Police are trying to trace three men who were seen on the roof of a building that was later destroyed by a fire. 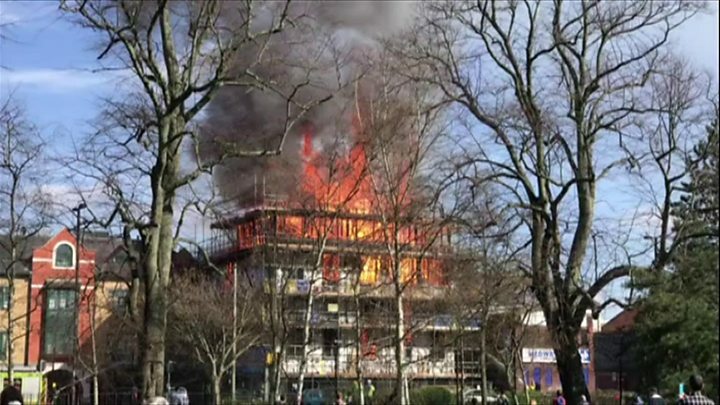 More than 70 firefighters tackled the blaze in Southampton, which started on the uppermost fourth floor of the commercial property which was under construction. It spread to the roof of a neighbouring block of flats in St Mary's Place which was evacuated. Police have issued an image of the men in an attempt to trace them. The fire, which broke out at 14:00, engulfed the whole of the vacant timber-framed property between St Mary's Place and St Mary Street. Neighbouring flats in Hampton House were evacuated "as a precaution", the fire service said. The blaze also damaged flats and shops in St Mary Street and Kingsway. Police said the cause of the fire was unknown. Det Sgt Marcus Baker said: "We had several reports in relation to.... three men on the roof of the building at around 12:30." Some residents have been unable to return home due to fire damage and have been offered accommodation by Southampton City Council, police said. The fire was fully extinguished by 19:45, although fire crews have remained on the scene damping down.